Music has the power to evoke emotions and memories and can create new memories. Music is also a medium that can bring people together through shared experiences, battle depression, improve cognitive function and reduce stress. Best of all, you don’t have to be a professionally-trained singer or musician to enjoy the benefits of music therapy. Whether you decide to listen to some nostalgic tunes or learn to play a new instrument, there are a number of ways to reap the benefits that music offers. Many older adults struggle with feelings of isolation, depression and anxiety. Music creates shared experiences, and can help keep feelings of loneliness at bay. Whether you join a choir or attend a concert, music can help create new, meaningful memories and can be the basis of forging new friendships. Social interaction is a balm for anxiety and depression. Music can have a powerfully calming effect. Playing classical music or any type of soft music that appeals to you can minimize feelings of anger or stress and may even assist with insomnia. Sharing musical experiences with others is also a way to reduce anxiety. It’s hard to feel stressed with enjoyable music playing and friends laughing. It’s not unusual for memories to be be attached to a musical tune or a snippet of a melody. In this way, music can be a powerful tool for mitigating the effects of cognitive and memory issues. Sometimes, a memory can be recalled simply by hearing a particular song. In addition, learning a new song or a new musical piece can help exercise the memory “muscle” and build new memories. Music engages the areas of the brain that are involved with making predictions and paying attention, and research shows that music can actually help the brain organize incoming information. 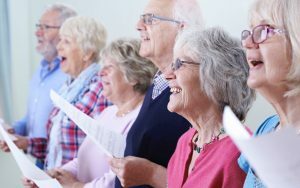 In some cases, music has been demonstrated to slow the impairment of speech and memory associated with Alzheimer’s and other forms of dementia. Studies have also proven that music can help evoke responses from those with Alzheimer’s who can no longer communicate verbally. Music has the power to move people – both emotionally and physically. Lively, fast-paced tunes may inspire us to clap our hands, tap our feet or get up and dance. Even swaying to music in a chair helps increase blood flow and reduce stress. And for those with more mobility, dancing is a fun exercise that promotes coordination, muscle strength and endurance. However you choose to enjoy the benefits of music, it’s important to find a supportive community that provides plenty of opportunities to share musical experiences. One of the biggest benefits of living at Lighthouse is the wide variety of activities and events that are offered. From music classes and dances to outings for local concerts, we offer musical experiences that will enhance the quality of your life. To learn more about Lighthouse Senior Living, contact us to schedule a tour.